NASHVILLE–The Tennessee Titans went 80 yards in five plays to score the game-winning touchdown in a 20-16 win over the Packers at LP Field on Saturday night. Packers undrafted rookie linebacker Korey Jones intercepted a Zach Mettenberger pass with 8:33 to play and Mason Crosby kicked a 32-yard field goal that gave the Packers a 16-13 lead, but Mettenberger roared back with two big completions that moved the ball from the Titans’ 20 to inside the Packers’ 10. Titans running back Jackie Battle ran seven yards for a touchdown with 5:02 to play, and the Titans had their first lead of the night. Pass interference against the Titans on a Chase Rettig pass for Alex Gillett moved the ball 41 yards to the Titans 43. On third-and-10, Rettig found rookie tight end Justin Perillo for a first down at the Titans’ 32. LaDarius Perkins gained eight yards to the 24, second-and-one, with 1:56 to play. The Packers faced a third-and-one with the clock ticking. Perkins was stopped for no gain, fourth-and-one. Rettig’s pass for Kevin Dorsey was incomplete. The fourth quarter was the only quarter of the game not played in rain, but the quarter was dominated by the depths of each team’s roster. 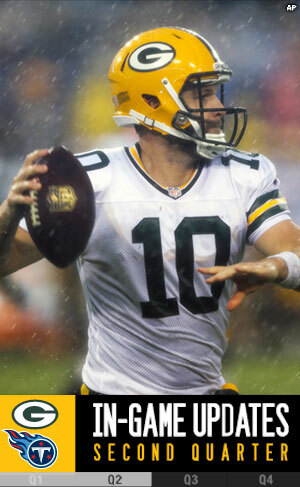 Starting quarterback Matt Flynn completed five of 10 passes for 49 yards. His replacement, Scott Tolzien, was eight of 12 for 124 yards. 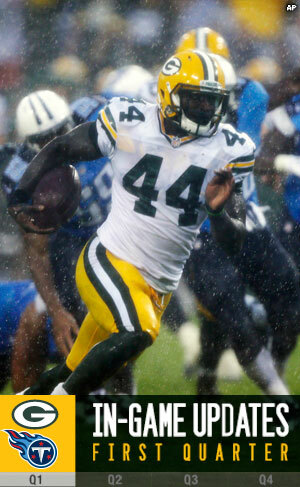 Running back James Starks rushed six times for 49 yards and rookie Rajion Neal gained 39 yards on five carries. The Packers take an 0-1 record to St. Louis for game two of the preseason next Saturday. NASHVILLE–The Packers went 79 yards in seven plays on their first possession of the second half, but the Titans followed with a touchdown drive that left the teams tied, 13-13, following three quarters of play at rainy LP Field. Quarterbacking an offense featuring second- and third-stringers, Scott Tolzien pitched a 17-yard pass to Chris Harper, and rookie running back Rajion Neal followed with a 15-yard run. Two plays later, Tolzien found Harper for 38 yards down the left sideline to the Titans 20-yard line. On second-and-two, Neal scored on a 12-yard run and the Packers had a 13-6 lead with 7:59 to play in the third quarter. The Packers went for two points and failed when Tolzien’s pass for Harper fell short of its mark. Tennessee’s biggest play of the second half was a pass interference penalty against Green Bay’s Demetri Goodson that put the Titans at the Packers 43. Quarterback Charlie Whitehurst followed with an 18-yard strike to the Packers 25. On consecutive carries, rookie running back Bishop Sankey moved the ball to the Packers 8-yard line. On third-and-five from the 5-yard line, Whitehurst pitched to Sankey, who was all alone in the right flat. The Titans’ PAT kick was low and wobbly, but it tied the game at 13-13 with 2:32 to play in the third quarter. Tolzien roared back with a sharp pass to Alex Gillett that gained 21 yards and then Tolzien converted a third-and-five with a completion to Kevin Dorsey at the Titans 39. Another completion to Dorsey left the Packers at the Titans’ 33 as the quarter came to an end. Vic, I’m 31, 150 pounds soaking wet, and possess maybe average speed. However, I can call for a fair catch and field it cleanly every time. Will you put in a good word for me with Ted. I’ll except the league minimum. Big, fast, angry men are running at you, yelling terrible things at you as you look up into the sky. Sure, you’d catch it. Football doesn’t stop. No matter the conditions, the show must always go on. Have you ever been part of a game that has been called off? Who called it off? It was the 1976 College All-Star Game. The skies opened up and there was lightning and thunder and everybody left and nobody came back, including the teams and the fans. It would be the last-ever College All-Star Game. Vic, do you think the mixture of the short dump-off passes and runs up the middle we have seen in the first half of the Titans preseason game will be a trend throughout the regular season in setting up the deep ball play-action for Nelson/Cobb? I see virtually nothing for the TE game other than run/pass protection on the offensive line. Never, ever consider scheme in a preseason game. Coaches do everything they can not to do in a preseason game what they will do in a regular season game. Vic, the run game has jumped out so far, but what individual on defense has done it most for you? It’s Clay Matthews. I was encouraged by what I saw. I am having a hard time seeing with the rain. Who’s looking sharp, Vic? James Starks was outstanding. He’s picked up right where he left off last season. He was about to go to Pittsburgh for a free-agent visit when the Packers signed him to a new contract. Remember that. I think re-signing Starks is real big. What are your impressions now of moving the PAT back, after seeing the first half of the game? How badly do you think those muffed punts are gonna hurt Adams? They won’t help. A coach must have confidence in his return man to catch the ball. It’s that simple. Catching the ball cleanly and securing it in the rain would’ve been a perfect way for Adams to gain his coach’s trust. Vic, as the camera pans around the stadium for this first preseason game, I have to wonder how many people showed for the game? I see the rain is heavy, but there are a lot of empty seats out there. LP Field is half full; that’s a kind assessment. Anne, this isn’t Green Bay. This is the real world. A lot of teams don’t have the history, tradition, fan base and championship-season hopes the Packers have. The Titans franchise lost its founder and owner, Bud Adams, and it’s trying to get back to where it was in the Steve McNair years. Nashville is a good town. Pro football prospered here once before and it’ll prosper again. I’m dry, but I wouldn’t be dry if I was sitting a few feet to my left. That position has been vacated and a bucket now sits on the desk top to collect water dripping from above. NASHVILLE — The rain stopped and started again in the second quarter at LP Field in Nashville, but the score didn’t change as the Packers took a 7-6 lead into halftime on Saturday night. The Packers had good field position at the 50 after a shanked punt, but QB Matt Flynn fumbled the snap on first down and the drive went nowhere. On their next possession, the Packers moved inside the Titans’ 35-yard line following a 23-yard catch-and-run by TE Brandon Bostick, but an offensive pass interference penalty on WR Jarrett Boykin on the next snap stalled things, leading to another punt. Tennessee had one potential scoring drive, converting a third-and-2 with a scramble and throw by QB Charlie Whitehurst to RB Bishop Sankey for a 23-yard gain. That put the Titans at the Green Bay 25. But a sack by CB Jarrett Bush on a slot blitz pushed the Titans out of field goal range, and they were forced to punt in the final minute of the half. Scott Tolzien came in for the final Packers series, and he moved the offense across midfield but was sacked on the final play of the half. NASHVILLE–A missed extra point attempt by the Titans was the difference in a 7-6 score following one quarter of play at LP Field on Saturday night. DuJuan Harris returned the opening kickoff 40 yards and the Packers started at their 36. Matt Flynn was the starting quarterback and James Starks the starting running back, as Aaron Rodgers, Eddie Lacy and Jordy Nelson were given the night off. The game began in a heavy rain that began during pregame. Flynn completed a pass to rookie tight end Richard Rodgers that gained 10 yards and a first down at the Titans 38. The Packers faced third-and-three and James Starks exploded off left tackle for 11 yards to the Titans 20. Starks followed that run with a 20-yard touchdown burst up the middle and the Packers had a 7-0 lead with 10:34 to play in the first quarter. Mason Crosby’s PAT kick was from the 15, which is an experimental spot in the preseason. The Packers defense forced a three-and-out and the Packers offense was back in business at its 22. Coach Mike McCarthy began substituting reserves into the lineup on the Packers’ second possession. The Packers failed to move the ball. A new-emphasis holding penalty on Casey Hayward allowed the Titans their initial first down. The defensive starters remained in the game through the Titans’ second possession, which concluded with another punt, but it was fumbled away by rookie Davante Adams and the Titans recovered at the Packers’ 13. It was the second time Adams mishandled a punt. Titans running back Shonn Greene scored on the next play, but the Titans kicker missed the point-after attempt and the Packers clung to a 7-6 lead with 4:22 to play in the first quarter. Harris rushed for 11 yards and a first down on the Packers’ next possession, but the drive stalled and the Packers were forced to punt.